A view of Zürich, Switzerland. Zurich (German spelling: Zürich; French spelling: Zurich; Romansch spelling Turitg; Italian spelling: Zurigo) is the largest city in Switzerland and is a cultural hub of business and commerce within the nation. 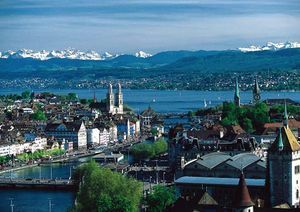 Zurich is situated in the relatively flat Swiss plateau, north of the Alps. It is on Lake Zurich (German: Zürichsee) at the point where the river Limmat exits the lake. Zurich also has Switzerland's largest and main international airport, and the largest rail station in Switzerland (Zürich Hauptbahnhof, abbreviated as: Zürich HB) which has 2900 departures daily. Zurich has an extensive public transport network of suburban trains ("S-Bahn"), trams and buses. Over half of commuting journeys within the city use public transport and only 17% using cars. Zurich is a common stop for international travelers. The population of Zürich is approximately 390 000, of which 30% are not Swiss citizens. ↑ http://www.stadt-zuerich.ch/content/prd/de/index/ueber_das_departement/medien/medienmitteilungen/2012/maerz/120301.html "The city of Zurich has grown to 390 000 inhabitants". Press release from the city of Zurich, March 2012. This page was last modified on 12 September 2016, at 17:28.